A flat moulding that is used to cover the joints in sheet or flat panel material. 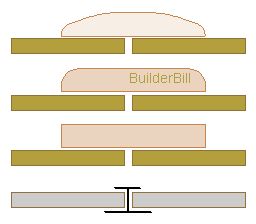 An out-moded way of covering joins in sheet materials. The sketch above shows a few patterns but there would probably have been many more. The bottom one is a modern replacement for joining standard thickness sheets of wall sheeting. They used to be out of extruded aluminium but now PVC seems to have taken over. Cheaper to buy and easier to work with.. 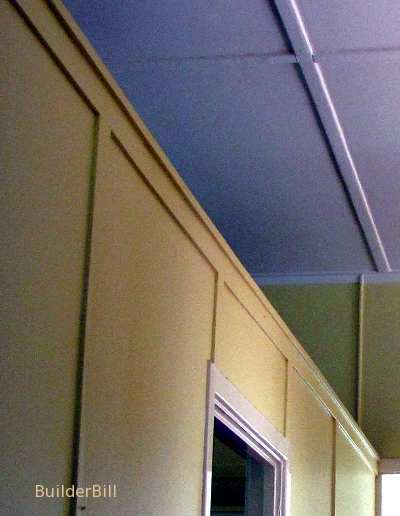 Here is an old house that uses plain rectangular battens on the walls and the ceiling sheet cover battens are slightly smaller and have rounded edges. Not quite a "D" mould.